Caution: regular readers may be shocked to find references to the real world in what follows. 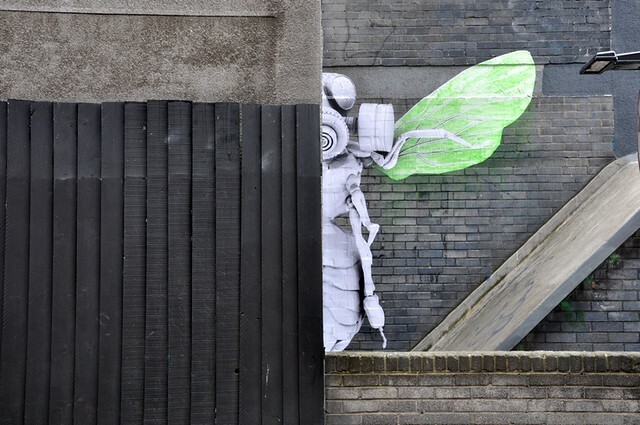 Since his street art first appeared on London’s walls in 2008, Ludo’s paste ups have been a frequent delight around London. His dark and occasionally surreal vision sees nature take up arms, what at first glimpse may look like an exotic plant or insect species on close inspection reveals a sinister hybrid organic techo-weaponry. 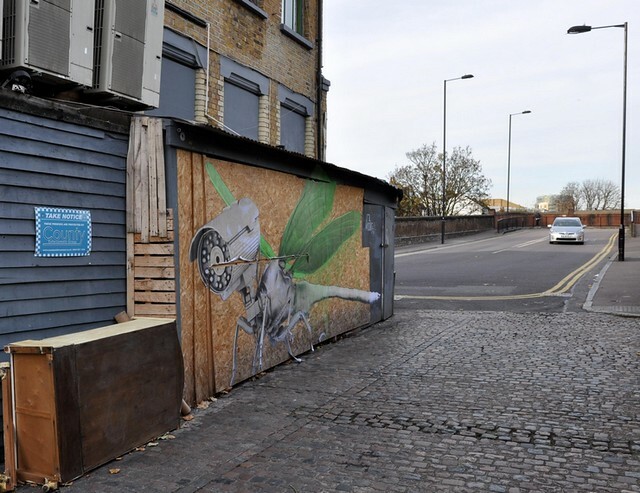 There is a genuine integrity to Ludo’s pieces, they are generally put up without permission after a bit of a wander to find just the right spot, they involve a bit of pasting and a bit of paint flinging, he finds the spots himself and often he locates virgin walls previously undefiled by street art. 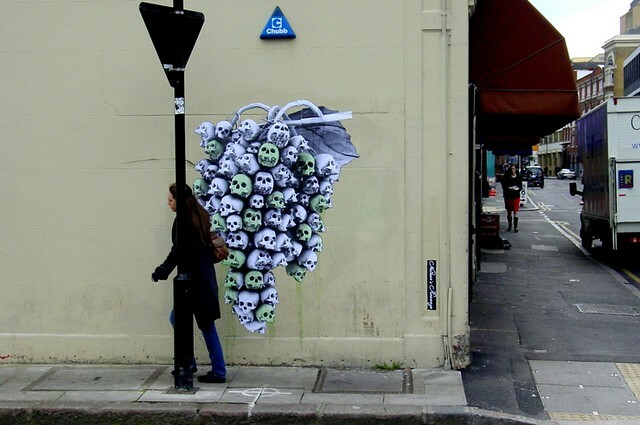 The additions are not always to the immediate delight of the property owner, as street art should be. 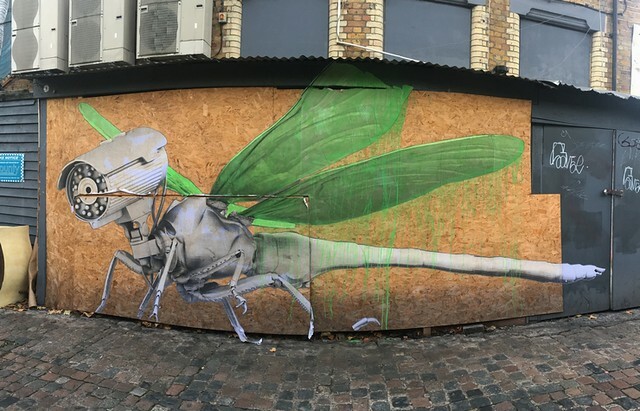 Ludo was back in London last week and as usual put up some stunning original paste ups. Locating the first piece was relatively easy as in the early photos (hat tip GS-L Studio) that appeared online a business name was visible. 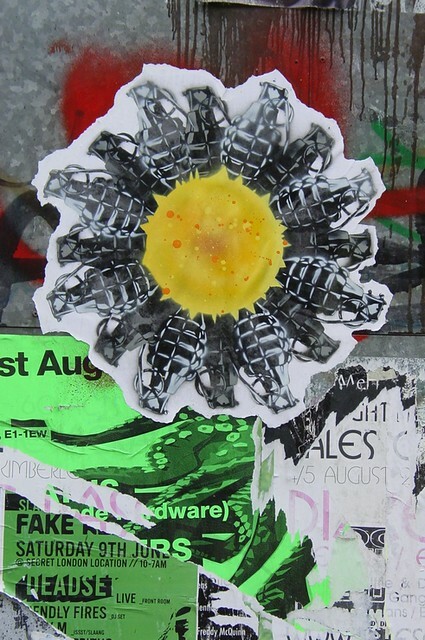 Unbeknown to Ludo, the business proprietor found a very direct personal connection to Ludo’s new artwork on his wall. 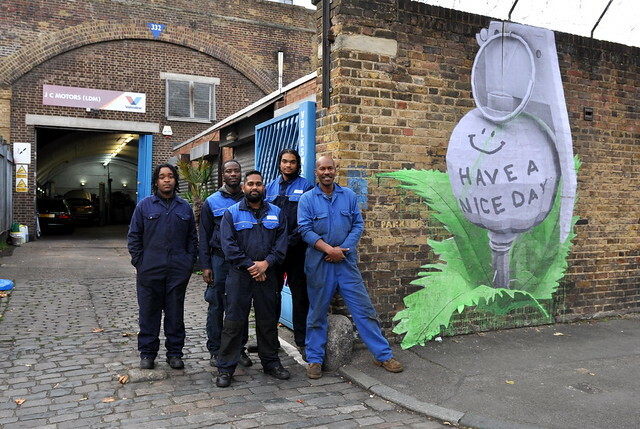 The business is JC Motors in Haggerston, owned by Len Maloney. 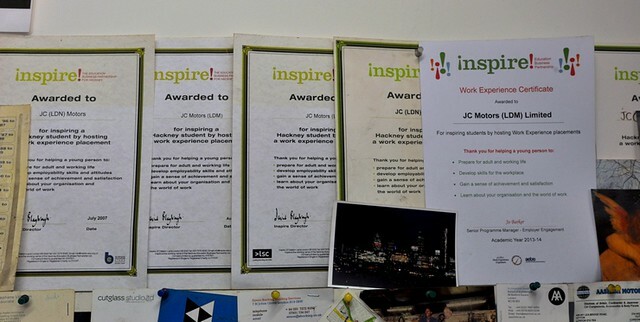 JC Motors has been housed in a railway arch under the East London line for the past decade. The property owner is Transport For London who has demanded massive rent increases from JC Motors and many other businesses who call the railway arches home. TfL’s massive rent increases are evidently fuelled by the almost implausible idea that these grimy unfashionably hardworking and hardwearing backstreet locations must be elevated by vague proximity to trendy coffee shops and the City of London’s halls of capitalism. At the same time, small businesses in Hackney are also facing huge increases in business rates. 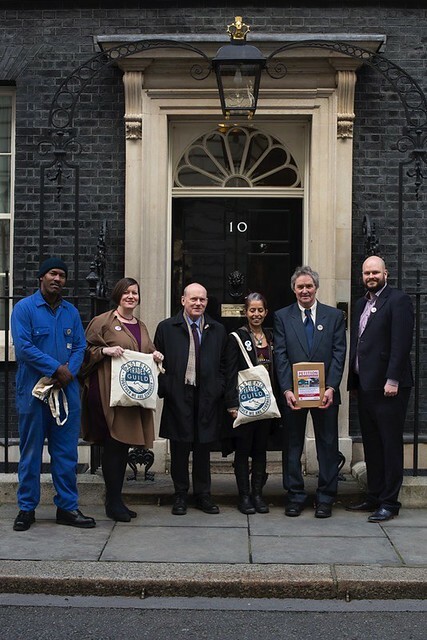 Earlier this year Len was one of a delegation from the East London Trades Guild who presented a petition to Downing Street on behalf of business owners across East London who face extinction. The East London Trades Guild is now playing a major role in supporting small businesses, many of them facing the same situation as JC Motors not just with TfL but Network Rail too. The history of Len’s business and the story of the petition are told in typically eloquent and readable style by the brilliant Gentle Author on the Spitalfields Life blog. As an aside, if you have the vaguest interest in East End history or the stories of its inhabitants past and present then do sign up for the Gentle Author’s daily blog posts, I have enjoyed them for many years. 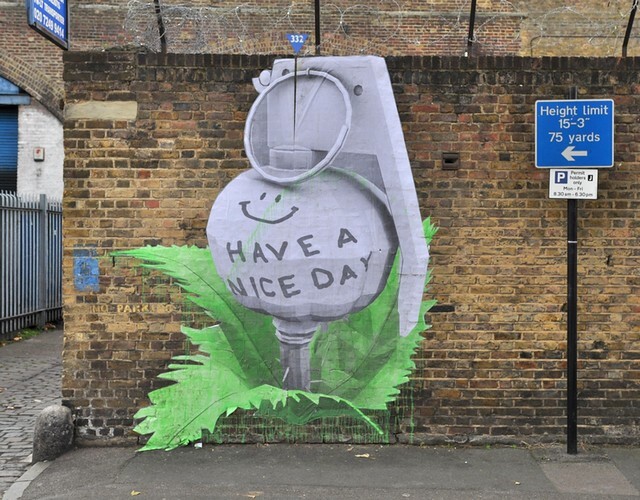 One of the many beauties of street art is that the work reaches out to the normal “everyman” everyday audience a long long way away from the world of art institutions and learned academics, people can and do respond to the artwork however they like. 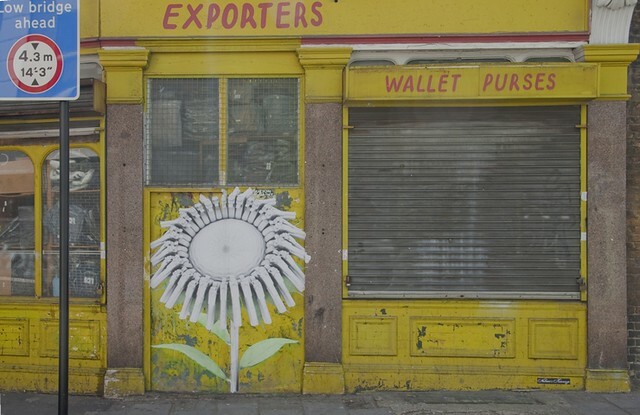 It is wonderful to find a true gentleman like Len discovering such a deep and personal significance to a totally non permissioned art intervention on the street. 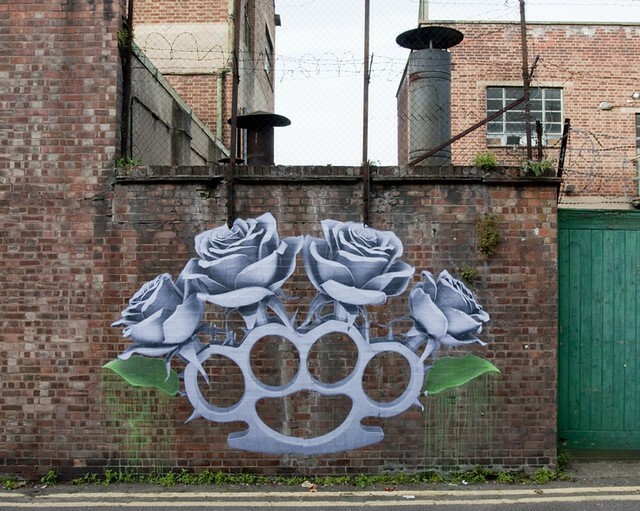 When asked why he chose this spot for this piece of art, Ludo told Graffoto “the spot just felt great for me visually...from the barbed wire, the bricks, textures...that's how I find my spots as I don't really know what's going on inside. The only thing that motivates me is to tell a story and the background is as important as the artwork”. So, that Len saw such a specific relevance in the artwork to him and his team is pure serendipity; “[the] good thing about art is you take it as it touches you” says Ludo. Ludo did a couple of other pieces and somewhat I also found a rather unexpected personal connection to one of them. Graffoto normally despises rolling out the first person singular but hopefully you will indulge on this occasion. 25 years ago thereabouts Lady NoLions and I lived in Dalston, back in those days I wasn’t NoLions but she was and she remains a lady. Her then employer gave her a company car, remember when they were prized perks? This hot hatch (the car, not Lady NoLions) kept getting stolen and one Saturday morning we got a call from the police to collect the trashed and abandoned car. Thieves had stolen her car by shattering the built in steering lock, evidently the car wouldn’t steer properly so instead of joyriding on two wheels around a 90 degree left turn they followed a fast but lazy arc into the wall opposite. Although I have not been on that street since that day, in the first night time “work in progress” photos (gslstudio again) I recognised the wall in the background as the one where the Golf GTI speed test had come to a shattering end. 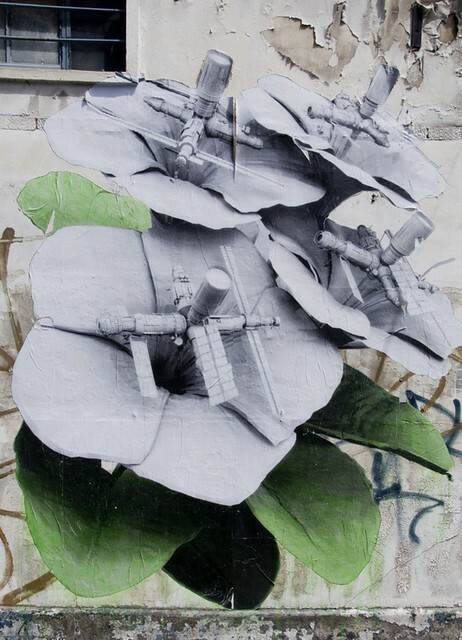 Sometimes the personal connections to a piece of street art are just a bit less wonderful! 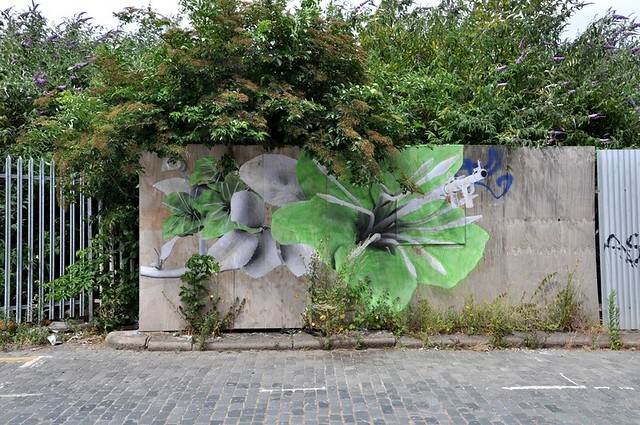 Ludo’s other new piece of street art that appeared last week is a classic study in monochrome and green in which nature and the hint of violence collide.